Such failures are seriously worrying in Formula 1. Along with wheel-over-wheel accidents and flying debris, a front wing failure is deemed to be one of the most likely causes of a serious accident. The gravity of such an accident depends on the circuit where it happens and on the speed of the car. One has only to think back to Roland Ratzenberger’s fatal crash at Imola in 1994 to know what can happen. The circuits of today are designed to be as safe as possible and the safety measures take into account a certain amount of component failure, but these cannot cover every eventuality and it is still to some extent down to chance where it happens. There is bound to end up being talk about whether a car designed wholly with CFD is more likely to have such failures. There is no theoretical reason that this should be the case. In any case, the team’s technical director Nick Wirth will not need reminding of the potential hazards involved. 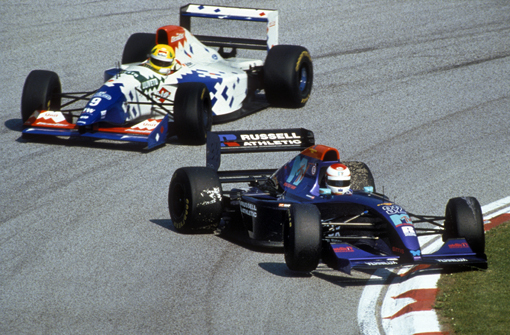 Ratzenberger died at the wheel of a Simtek, the team that was run by a very young Nick Wirth. It was later explained that Ratzenberger had ridden over a kerb on the previous lap (below) and that this had weakened the front wing, leading to its failure under loading at high speed as the car went down towards the Villeneuve Corner at Imola. The Virgin team says that the problem with the front wing mounting has been identified and will be fixed. The above image was supplied by my pal Peter Nygaard of Grand Prix Photo. Check out his site. He has a great collection. Joe, you’re right to point out that front wing failures are potentially very serious. However, it is better that this kind of incident occur during pre-season testing than on a live (and more congested) track during a Grand Prix weekend. Hopefully the lack of testing that the newer teams will be getting in won’t substantially increase the risk of things like this happening during race weekends. Difficult to see what difference CFD would make. Surely you test the assembly itself under loads? Windtunnel testing is irrelevant. On the point of identifying the cause… what was the result of the FIA investigation into the rear spring failure on last years Brawn? From an engineering perspective I’m keen to hear the reason. any insight Joe? I hadn’t seen that photo before. It knocked me back a bit. I don’t think I want to look at it again. In some ways it’s worse than an image of the accident itself. Weird, huh? I think the real problem is a bit more obscure. Teams with no current knowledge of F1 load case numbers will have a learning curve, CFD or wind tunnel makes no difference if you don’t have good numbers to start with. They will also have a steep learning curve in the area of manufacturing and quality control, this is something that dear old max did not take into account when thinking about budget caps and making cheap cars. Oh well, all part of the learning curve of the new F1. Opinion here is…mixed. Most of the car owners curiously enough are on board with this 100% and are willing to play politics with this. I saw it. I moved on. I guess it is different. IRL needs that. It needs something to get people excited. In my day in F1, there were basically no computors used, and no moving ground plane tunnels. Sometimes things broke, same thing today, You still have to rely on plain old common sense engneering at the end of the day. Buttom line, common sense has to prevail! @rj There is a reason why three wheeler off road vehicles were banned 20 years ago. They topple over too easily. The “tricycle” design is immensely unstable despite their marketing department’s best attempts at equivocation. I’m surprised an engineering firm could even take the idea seriously. Unless the rear tires were so wide that their inside rim was at the same point as the inside rim of the front tires. But who is going to build 4 foot wide tires? I thought the plan was supposed to _cut_ costs. Apparently the Delta Wing was originally designed as a three-wheeler, but apparently when the experts were consulted, they deemed it a motorcycle and not a car. Clearly the DeltaWing is designed for a single specific purpose, namely NASCAR-style racing on ovals. Aero suited only for going in a straight(ish) line; that narrow front stance the same; wheel fairings to allow some contact at high speed without incident, and an engine that will drive it around at a decent sustained rate of speed but would be useless on a circuit with more than four turns. I’m sure it would provide reasonably interesting, “closer” (ie more contact and bumping) racing on ovals. But on anything other than an oval a Formula 3 car would run rings around it. Ben Bowlby has a history of putting out these hairbrained design studies. I have yet to see any of them actually go any further than the CAD system. It is utterly insane to think that a car with the front wheels so close together can race on a road course. …is fascinating. at 0:15 you can see the front wing snap neatly in half right at the mid-point. The struts keep it in place, endplates dragging along the tarmac for a few seconds, and then the whole assembly is pulled under the front wheels. To my completely uneducated eye, that failure looks either like a serious fabrication problem — how often does a carbon-fibre component just snap in half? — or somebody having dramatically underestimated the aero loads on the wing. Either way, not very promising, is it? Strange that the failure happens, apparently, when braking for the right-hander. I’m no engineer but shouldn’t the load on the wing be decreasing under braking? Load woud decrease with speed, though that might introduce a flex that would cause a break. In theory the weight transfer of braking would cause the front end to dive, thus increasing the incidence of the wing and thus the load, but I would have thought the dive on an F1 car was minimal. These cars are prototypes …designers must be encouraged to seek better blue sky solutions & not feel inhibited which there’s a danger of if they are held accountable. (All too common in a modern F1 office). It’s through mistakes that progress is made…..
Couldn’t agree more….You know that Wirth will be flat out sorting the problem. Anyway, Martin C and Cynic, I’m no engineer either, but obviously under braking the load would be coming off the wing, so it does seem unlikely to have been stressed to breaking at that particular point, with the car slowing for the right-hander. But if carbon fibre behaves the same way metal does, weakening at points of repeated stress, then it would make sense that the wing could snap at the point of greatest past stress as it unflexed as the car slowed. Same principal as bending a wire repeatedly to break it, I suppose, or metal fatigue failures on aircraft. Carbon fibre ice hockey sticks seem to behave in a similar fashion. They tend to shatter at apparently random times under comparatively light loads — not necessarily only when a player unwinds with a massive slapshot. But in any case, it still seems to point to a wing which was either properly designed but defective in its fabrication and contained a flaw which allowed it to break under pressure (interesting that it should happen right in the middle though), or which was properly manufactured, but to a specification which was not robust enough to handle the loads placed on an F1 front wing. Joe, this video has been removed from YouTube.